Muck boots electric black/muddy girl camo print and a self-cleaning ribbed outsole, the women’s hale is the perfect three-season boot. 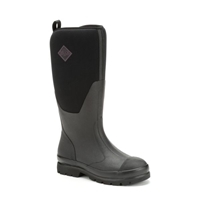 This stylish and casual 8-inch Winter boot offers convenience, comfort, and warmth. The boot design is finished with a metal buckle detail on the outer leg for added style. We’ve taken our iconic Chore boot and redesigned it specifically for women. Fashion and function come together in these Muck Arctic Weekend Series Mid-Height Rubber Women's Winter Boots. The warmest women’s Muck Boot has been upgraded for improved warmth and comfort for use in some of the coldest conditions. 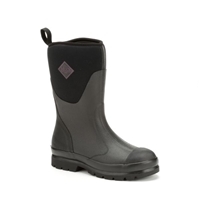 One of the warmer women's Muck Boots has been upgraded for greater warmth and comfort. Muck's warmest women's boot is back! Style updates in new colors present cleaner, sleeker lines, while upgraded warmth and comfort features help you face some of the coldest conditions in the hemisphere. Waterproof design, warm fleece lining, slip-resistant sole, and a sleek leather look make these boots perfect for shoveling the drive or relaxing in the ski lodge. Tough Spandura and an extended rubber shaft round out the cold weather coverage of these waterproof winter boots.